Kanazawa Soke (10th dan black belt) is one of the world most renowned and respected traditional karate masters. Hirokazu Kanazawa was born in 1931 in Iwate prefecture , Japan. Although trained in Judō in his early years, Kanazawa Soke took up karate whilst at Takushoku University under the late headmaster of the Japan Karate Association, Masatoshi Nakayama Shihan. Kanazawa Soke is also one of the few remaining karateka privileged to have studied under Gichin Funakoshi Ō Sensei, the famous Okinawan schoolteacher who brought karate from Okinawa island to mainland Japan. The founder of the “Shōtōkan” school of karate. Hirokazu Kanazawa is also the first karateka to have won the notorious All Japan Championship. In 1957 he became kumite champion while nursing a broken wrist. Kanazawa Soke was a prominent instructor of the Japan Karate Association, but in 1978 he decided to establish the S.K.I.F. (Shōtōkan Karate-Dō International Federation). SKIF is a governement recognized nonprofit organisation. 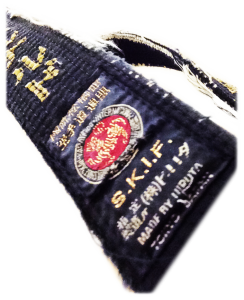 Since 1978 SKIF has been expanding its activities and became a very big Shōtōkan Karate organization with branches in more than over 100 countries. Kanazawa Soke is also the author of numerous books spreading correct Shōtōkan Karate technique and philosophy all over the world. At 83 years old, Mr. Kanazawa decided to retire from active teaching and travelling. Mr. Kanazawa held two 2 important positions in the SKIF federation. - Kanchō = top or head of the house/organisation (similar to president). - Shuseki Shihan = chief instructor, top of the instructors. During a special ceremony held in Tōkyō, on the 5th of April 2014, Mr. Kanazawa assigned the position of Kanchō to his oldest son Nobuaki Kanazawa and the position of Shiseku Shihan to Manabu Murakami. Since this day, we refer to Mr. Hirokazu Kanazawa as “Soke”. Soke, means “head of the family”. In the realm of Japanese traditional arts, it is used synonymously with the term “iemoto” (= the head of a school). It is most commonly used as a highlevel Japanese title.